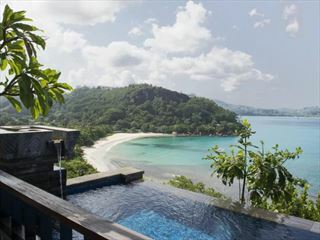 Experience the natural beauty of the Seychelles at Hilton Seychelles Labriz Resort & Spa. 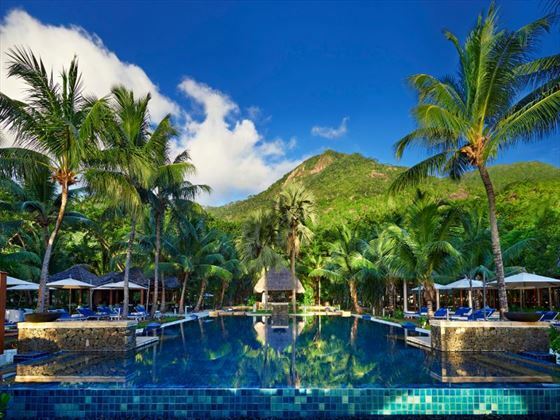 The only hotel nestled on the gorgeous island of Silhouette, this all-villa resort offers stunning views of the Indian Ocean, the white sand beach, and the luscious tropical forest that creates a secluded hideaway vibe. 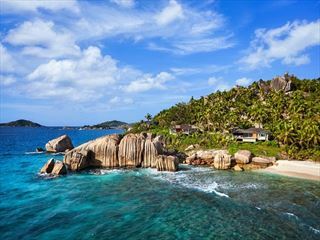 Based a little way from the tiny village of La Passe, there is an intimate and private feel to the resort, and its setting within a marine national park makes it a haven for wildlife lovers. Giant tortoises lay their eggs on the beach and there are also opportunities for incredible bird watching, plus diving and snorkelling excursions in the crystal blue waters. Walk across the lake located in the middle of the resort and you may even spot Simone’s House – a tiny beach hut that’s home to a white crab. Or, for something even more relaxing, how about swaying in a beach hammock as you nap in the sun? The resort really uses its natural surroundings, creating a charming ambience that epitomises the island lifestyle. Take for instance the Eforea Spa – built into ancient rocks and lush forest, the natural beauty that surrounds each treatment room is enchanting. Even the architecture and layout is a grand affair – beautiful villas line the beachfront and sit in the gardens, whilst the open-air restaurants, like Teppanyaki and Café Dauban, stand tall either next to the main swimming pool or the resort’s large lake. Whichever villa you choose, you’ll be a walkable distance from the resort’s fantastic amenities. The villas themselves are fabulous too, with awesome views, minimalist, beach-style décor, and some with their own plunge pool. With a soothing spa, a cool kid’s club, a large community pool and plenty of land and water activities, this resort is perfect whether you’re looking for a couples’ getaway, or a family holiday in the sun. 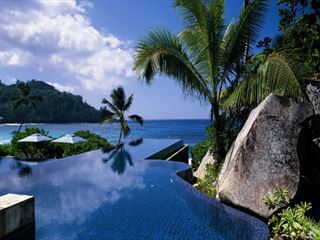 Further reading: Hilton Seychelles Labriz is featured in our guide to the top 10 luxury hotels in the Seychelles. 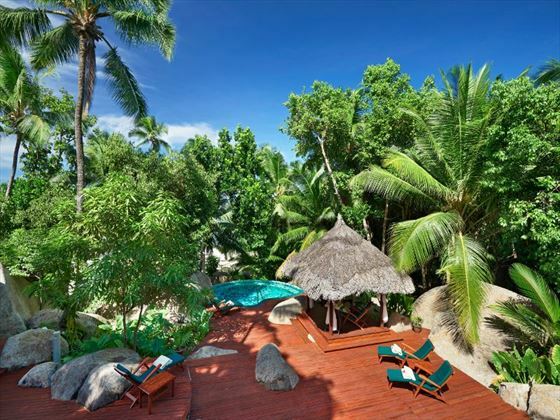 This attractive retreat is located on Silhouette Island – a large granite island 19 miles from Mahé with unspoiled jungles, towering mountains, and wide stretches of white-sand beach. Once home to pirates and plantations many years ago; the island is now home to a wide variety of holiday-goers and only 50 residents, though there are still a few plant nurseries and vegetable patches. The ambience here has that typical island vibe – tranquil, indulgent, and with a touch of fun. 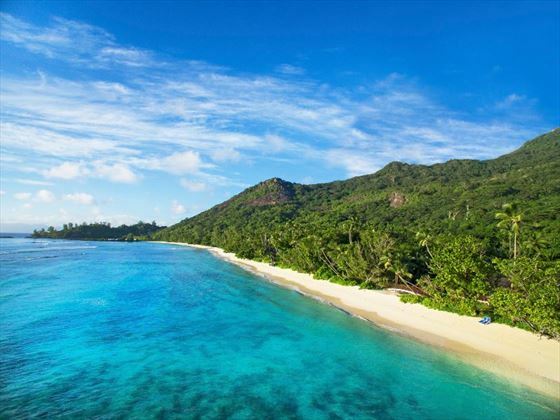 20km northwest of Mahé, you’ll need to take a 45 minute boat ride from the hotel's own jetty. With a stylish lounge, easy check-in and refreshing drinks, the jetty only enhances the hotel's luxurious ambience. King Garden Villa – These relaxing, minimalist villas offer lovely mountain and garden views, and are a fantastic affordable option for families. Sleeps a maximum of three adults, or two adults and two children. King Beachfront Villa – Sitting directly on the beachfront, these cool villas accentuate their excellent location with chic, beach-style décor. These villas feature beautiful views of the beach, with direct access to the warm sands from its private patio. Sleeps a maximum of three adults, or two adults and two children. King Beachfront Villa with Pool – With a large patio overlooking the marvellous beach, the views from these villas are certainly enviable. Head round the back and you’ll find a private garden, set with a small plunge pool and modern decking. Sleeps a maximum of three adults, or two adults and two children. Deluxe Beachfront Pool Villa – These villas are certainly luxurious, with a fabulous beachfront location, and a delightful large pool overlooking the ocean. You’ll even have your own personal hammock out on the large patio, along with a spacious indoor living area and a little outdoor pavilion with furnishing. Sleeps a maximum of three adults, or two adults and two children. 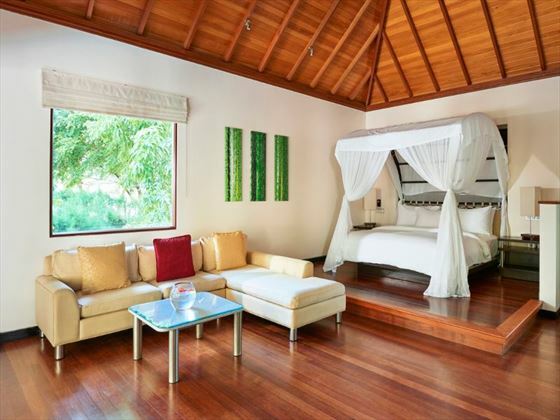 Deluxe Hillside Pool Villa – Nestled in the hillside, these villas have panoramic views of the island’s tropical jungle from their large private garden and plunge pool. 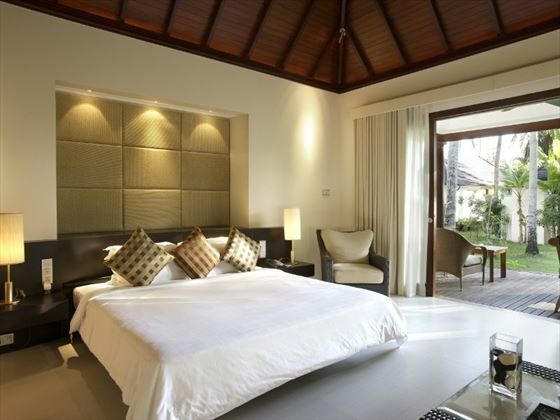 Very spacious, with fresh, airy décor, these villas embody the island lifestyle. Sleeps a maximum of three adults, or two adults and two children. 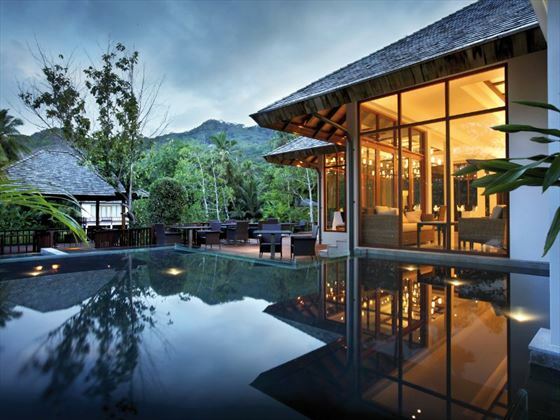 Presidential Villa – Very indulgent indeed, this stunning villa is set in the mountains, with unobstructed views of verdant jungle and the Indian Ocean. This villa has a very large pool, fit with a gorgeous pavilion and comfortable furnishings. There are two bedrooms, both with their own en-suite bathroom and private terrace, as well as a large living room. Sleeps a maximum of three adults, or two adults and two children. Café Dauban – Open for breakfast and dinner, this fabulous buffet restaurant offers a wide range of local and international cuisines that suit every taste. At breakfast, our sales team were pleasantly surprised by the large variety of honey and jams on offer – from papaya jam to orange honey on toast; this shows just how versatile this buffet can be. Teppanyaki – A beautiful, open-air restaurant open for dinner only – Teppanyaki offers a splendid menu of authentic Asian and Japanese fusion cuisine, with gorgeous views of the lake. The live show kitchen just adds that extra pizzazz. Sakura – Nestled only a few steps away from the powdery white beach, this open kitchen and sushi bar offers sumptuous Japanese fusion cuisine, served al-fresco under gently swaying palm trees. La Pizzeria – Authentic, gourmet pizzas and many more tasty snacks can be found at La Pizzeria. With its laidback vibe and island-style atmosphere, this is the perfect place to tuck into an Italian style lunch. Lo Brizan – Delicious, light meals are on the menu at this cool bar and restaurant. Tuck into a variety of platters and snacks as you sip on international wines and fruity cocktails by the pool. Portobello – This is the resort’s fine dining restaurant, offering sensational Italian cuisine and a fantastic selection of wines. With a gorgeous outdoor terrace overlooking the lake and luscious Mount Dauban, this is the perfect place to dine al fresco. Grann Kaz – Only a five minute walk from the resort’s entrance, this small restaurant is truly unique. Offering a wide range of Seychellois dishes, this intimate restaurant is set in the restored home of the Dauban family, and nestled in its own isolated enclave. 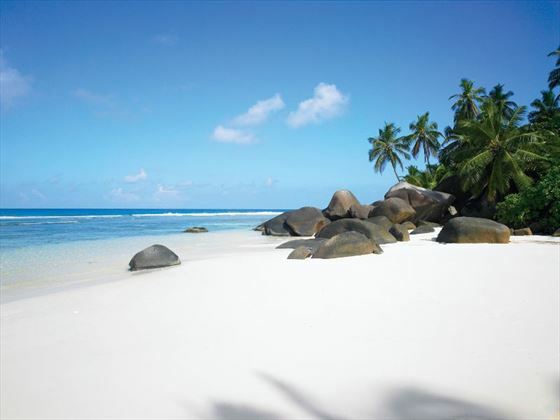 Hilton Labriz Resort & Spa is nestled on a large stretch of powdery white sand beach, spanning the whole of the resort. The beach is truly beautiful, with hammocks swaying between palm trees, bright azure waters, and some of the softest sand we’ve ever come across. Located near most of the restaurants, the resort has a large community pool free for everyone to use. 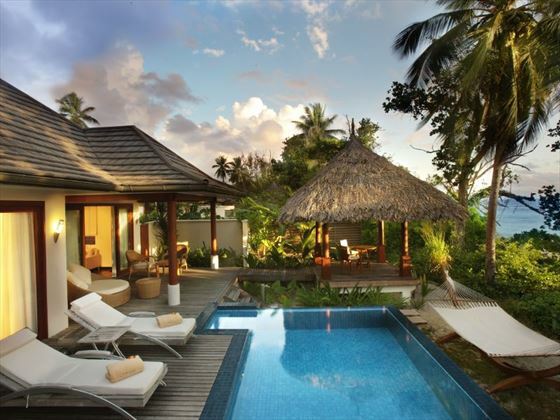 Guests with a pool villa will also have access to their own, private plunge pool. 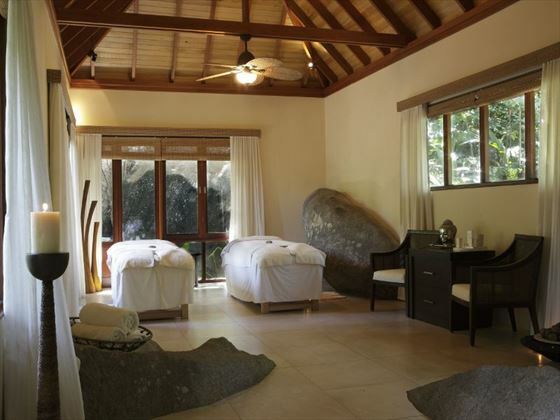 Eforea Spa – Be at one with nature at this beautiful well-being spa. Built into ancient rocks and the verdant Silhouette jungle, the spa uses its natural surroundings to create a fresh, uplifting feel, which is only intensified by its tropical public area – consisting of a spa pool, steam room, large decking area and Jacuzzi hidden by exotic flora. The public area is free for all guests at any time – and with such a secluded, intimate feel, we’re sure you’ll love heading here to relax. There are six treatment rooms in total, offering sensational massages, beauty treatments, and personalised treatments that help detox and revitalise the mind, body and soul. There are a lot of steps leading to the treatment rooms and public area, so if you have walking difficulties you may want to book an in-villa treatment – which will be just as serene and relaxing. Jungle Fun Kid’s Club – Open 9am to 5.30pm for children aged four and above, Jungle Fun Kid’s Club offers a plethora of exciting kid’s activities. For travel 1 Nov 17 - 10 Jan 19 honeymooners will receive 25% reduction on room and meal supplements & a complimentary sunset cruise for 2. For Honeymooner's a valid wedding certificate, dated no longer that 180 days before the arrival date, must be presented at time of check-in. The Wedding Anniversary offer is only valid within one month pre- or post-date of anniversary and a copy of the valid wedding certificate must be presented on check-in. Wedding Anniversary offer starting from 3rd year anniversary.